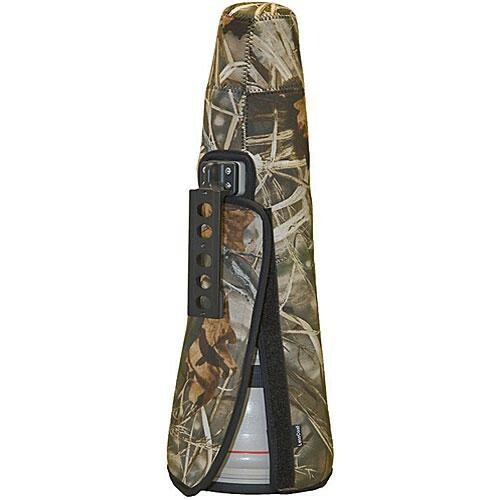 The Realtree Max4 TravelCoat Lens Cover for Canon EF 800mm f/5.6L IS USM Lens from LensCoat is a 3.0mm thick shock-absorbing closed-cell neoprene lens cover that is custom tailored to fit without the lens hood. It is designed to fully protect the lens when not in use, without the need for a more comprehensive lens case. It allows more valuable room for packing and storage. The coat simply slides over the lens and closes with a secure touch fastener. The Realtree Max4 is a detailed camouflage pattern that features cattails, millet, milo, corn stalks, sunflowers, oak and maple leaves, cedar and oak limbs, plus a variety of other plant life. Box Dimensions (LxWxH) 19.3 x 8.0 x 1.2"